Geekvape is located at Shenzhen, China- Home of worldwide branded ecigs. Established in 2015, Geekvape obtains strong support from an innovative group consists of experienced and enthusiastic vapers. Geekvape team devote themselves to superior vaping devices research and development. We aim at the demand of consumer, value products as core competence and resolutely put an end to all clone product. Below you will find the lowest prices, bargains and deals on GeekVape products. GeekVape was created to offer vapers premium products at an affordable price. 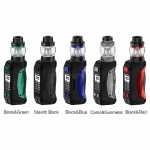 Save money today with the UK's biggest GeekVape deals website. Join UK Vape Deals and find the best discounts on GeekVape products from your favourite vape stores.